William was a shoemaker, probably working in South Shields, Northumberland. The first of three William Hill’s was born in South Shields, Northumberland on 3rd July 1804. 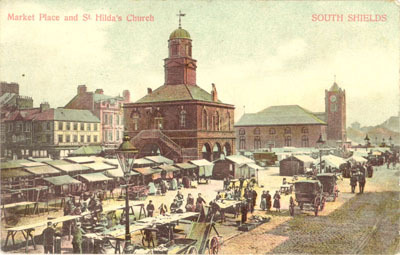 He married Jane Smith at St Hilda’s Church, South Shields on 11th May 1844. Jane Smith was born at Moor Houses, Tynemouth, Northumberland in 1818, so was somewhat younger than her husband. Although it was probably unusual for the times, they had just one child, William, born in 1852 (Camden Lane, Tynemouth). The 1851 – 1871 censuses describe him as a shoemaker. William died aged 75 at Rosalia Terrace, Sunderland on 21st June 1879. We know from William's marriage certificate that his father was James Hill, a baker, but I am trying to trace more details about James as this line currently ends here. The journey has stalled as I have hit a brick wall in that I have been unable to find my William on the 1841 census, prior to his marriage, when he would hopefully still be living with his parents. There is a William Hill born Northumberland 1804 on the census living at Camden Lane, Tynemouth, but he is married to Cora and they have a large number of children which, as he was described as a "bachelor" on his marriage certificate, rules them out. NB On the 1851 census one of this William's sons, Matthew, is living with his sister at Camden Lane (page 12) while my William and his wife are living at 94 Camden Lane (page 20). I am reasonably sure this is coincidental.